From left: Vice President of the Court in Aruba Jaap Sap and President of the Joint Court of Justice Eunice Saleh with newly installed judges Jack Verhoeven, Selma Verheijen, Marion Soffers, Jane Jansen and Arno van Suilen. 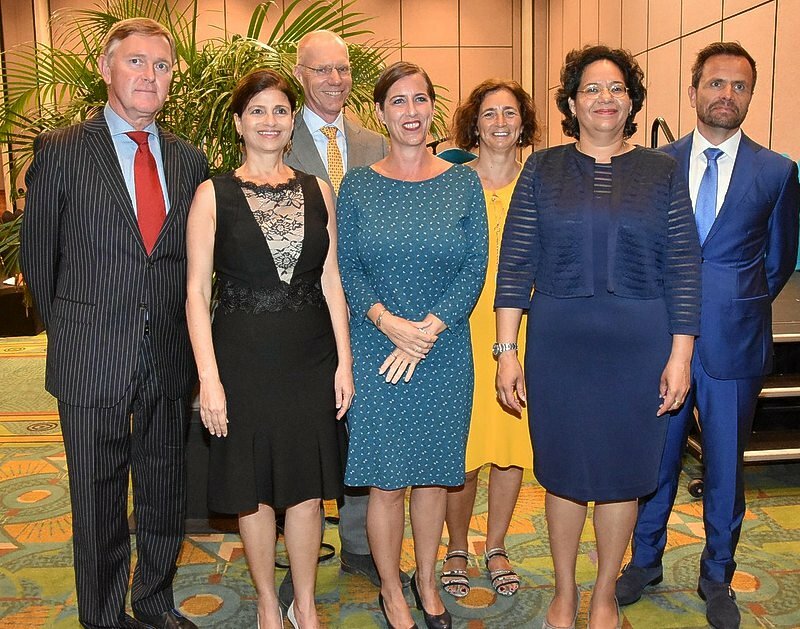 ARUBA–Five new judges in the Joint Court of Justice were installed in Aruba on Friday, among them Judges Arno van Suilen and Jane Jansen who will both be handling tax cases in the Dutch Caribbean. Appeal in tax matters has been possible in all countries of the Kingdom since April 30, 2016. As of that date, St. Maarten was the last of the countries to introduce legislation that makes this possible, following Aruba, Curaçao and the Caribbean Netherlands islands Bonaire, St. Eustatius and Saba. Before the introduction of the new legislation the taxpayer had to submit a complaint with the Board of Appeal in Tax Matters if he did not agree with a decision by the Inspector, without the possibility to appeal. This was considered undesirable, because it was against the principle that it should be possible to appeal a decision of a judge. Since the introduction of the new legislation, the taxpayer can lodge an appeal in the Court of First Instance against decisions of the inspector. The parties can then file for appeal in the Court of Appeals, which consists of three judges: a member of the Joint Court as chairperson and two tax judges from the Netherlands who have been appointed as deputy members to the Joint Court. From July 1, 2016, it is possible to file final appeal in cassation with the High Court of the Netherlands, which completes legal protection in tax matters. Aruba was the forerunner in this process in several respects. As of January 1, 2015, the second actual legal authority in tax matters was first introduced there. For this reason, the tax jurisdiction in first instance has been centralised in Aruba. The tax judge has his place of employment there and the tax clerk and legal support of the Court are also located in Aruba. A project to realise this was set up in 2014 under the guidance of an Aruban quartermaster, none other than Judge Jansen. She travelled to Aruba from a Dutch court to prepare the court registry for tax jurisdiction. Also, tax law is the first jurisdiction in which digital litigation has been introduced. Jansen will serve as tax judge in the Court of First Instance in all the Joint Court branches. She will also be working in the area of general administrative law. Jansen (48), who has been the Joint Court’s permanent tax judge since January 1, 2019, was born in Aruba and studied law in Leiden, the Netherlands, where she graduated in Fiscal Law in 1993. She worked at the Tax Office in Aruba between 1995 and 2007, after which she worked as tax manager with Ernst and Young Tax Advisers. She then returned to the Netherlands, where she worked as a jurist with the Court in The Hague. She assisted with the introduction of tax jurisprudence in the Joint Court between October 2014 and June 2015, and several months later she started her training to become a judge, which she closed off last year. The Courts in First Instance render about 500 verdicts in tax matters per year. On average, the Joint Court has ruled in 120 tax cases annually in 2017 and 2018. Meanwhile, 12 cassation appeals have been filed with the High Court of the Netherlands, which has rendered judgments in four cases thus far. The average lead time of tax cases in first instance is 120-220 days, Saleh said. Judge van Suilen will also be handling tax cases in the Dutch Caribbean. The member of the Joint Court since April 2018 is “passionate and enthusiastic, very thorough in his preparation in which he comprehensively examines tax issues. His analyses are sharp and accurate, and the way in which he puts these into words is enlightening and admirable,” Saleh said. The Joint Court President called all five new judges, including Selma Verheijen, Marion Soffers and Jack Verhoeven, “excellent judges” and a “gain” for the Joint Court. She wished them all “much success” in their new function in Aruba. The Joint Court of Justice will be celebrating its 150th anniversary on May 1. This day will be marked at all Joint Court branches on May 2. One day later, a symposium and a reception are scheduled in Curaçao. Dit bericht werd geplaatst in _Aruba, _Curacao, _Nederland, _Sint Maarten, Politie & Justitie, SXM-Daily Herald. Bookmark de permalink .